Understanding North Korean dictator Kim Jong Un’s desire for ballistic missiles and nuclear weapons is essential to fully comprehend the ongoing crisis on the Korean Peninsula, argues a former senior North Korean official. Thae Yong Ho, a former diplomat and the highest-ranking official to defect from North Korea in decades, argues that there are multiple explanations for Kim’s interest in nuclear-tipped ICBMs, with most linked to a crisis of legitimacy inside the rogue regime. “The unfavorable environment for Kim Jong Un’s early transition period made him pursue a nuclear and ICBM strategy,” he stated in his first public address in the U.S. at the Center for Strategic and International Studies in Washington, D.C.
Kim has launched more ballistic missiles and nuclear weapons than his father and grandfather combined. 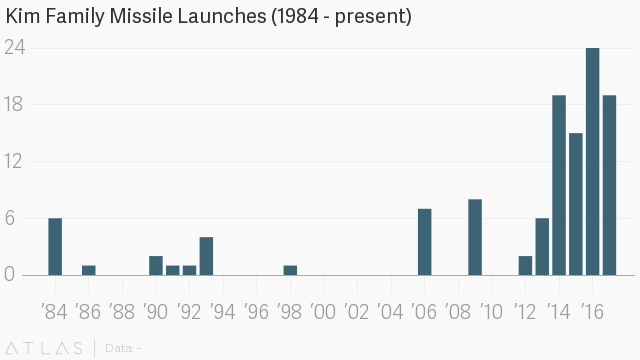 There was a marked uptick in the number of missile launches after Kim took power from his father in 2012. During his nearly six years as the leader of North Korea, Kim has also tested four nuclear bombs. The most recent nuclear test, the sixth and most powerful to date, involved a suspected staged thermonuclear device (hydrogen bomb), one which the regime asserts can be mounted on an intercontinental ballistic missile, such as the Hwasong-14 ICBM tested twice successfully this past summer. When Kim took over for his father, he faced a number of domestic challenges, Thae explained. Kim’s decision to pursue nuclear-tipped ICBMs stems from a lack of legitimacy, an unwillingness to engage in risky economic reforms, military concerns, and fears of foreign intervention, the former diplomat said at the Washington event. Kim was Kim Jong Il’s third son, and almost no one knew his name until only a few years before he took power. 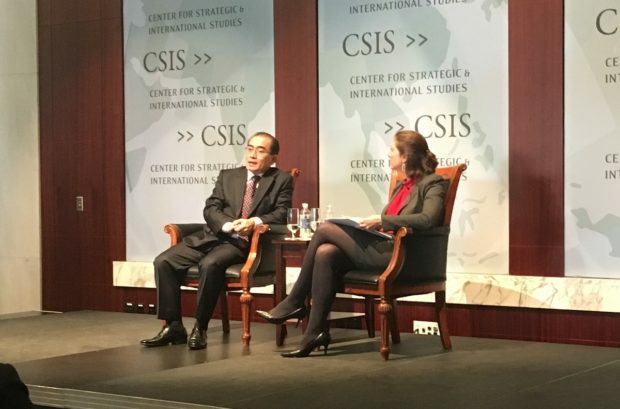 He was “a boy dropped from the sky” with no real friends in North Korea, the ex-official, a man decried as “human scum” by Pyongyang, told the reporters and scholars in attendance at CSIS. Kim learned quickly that while he held the title of leader, many did not see him as the true head of the North Korean state. This realization, coupled with a budding paranoia and distrust, led to a serious change in the young dictator’s political thinking. He purged officials who were considered a threat, including members of his own family, and those that knew and leaked the details of his family history. Kim also targeted officials who lacked enthusiasm for the country’s future. “He learned that whenever he convened a meeting … maybe 80 or 90 percent of the audience would sleep. So he learned that there was no enthusiasm – even in the elite group – on policy discussions.” Kim reportedly had a senior official executed last year for dozing off during a meeting. Thae described the purges, which were brutal, as “unprecedented” in North Korean history. The North Korean leader solidified his rule through a “reign of terror,” as Thae described it. The weapons program is a sign of strength for the regime. Kim also set forth a policy focused on achieving simultaneous development of the country’s weapons programs and the economy, a way to achieve visible results without engaging in risky economic reforms. When Kim first took power, he toured the military units along the Korean Demilitarized Zone (DMZ). “What he learned was (there was a) lack of preparedness for a possible war and (a lack of) high spirit, corruption, and obsolete conventional weapons,” Thae revealed, explaining that the nuclear and ballistic missile programs served as motivators for an unenthusiastic army. Thae suggested that an idle army is dangerous, exposing Kim to the threat of a military coup. More importantly, though, Kim watched what happened in Libya, recognizing the risk of humanitarian intervention in the North Korean regime. He observed closely the Arab Spring incidents, as well as the fall of Muammar Gaddafi. “This had a strong influence on Kim Jong Un,” Thae suggested. If there were an uprising in North Korea, “there is no doubt that Kim Jong Un would stamp it out mercilessly with his forces, with his tanks,” but that could trigger a response from the U.S. and South Korea. “If Kim is equipped with ICBM tipped with nuclear (warheads) then he can prevent that kind of humanitarian intervention,” Thae explained. Thae’s public address here in the U.S. suggests that Kim’s weapons program, as other leading experts and government officials have posited, is an effort to establish legitimacy and ensure long-term regime survival.